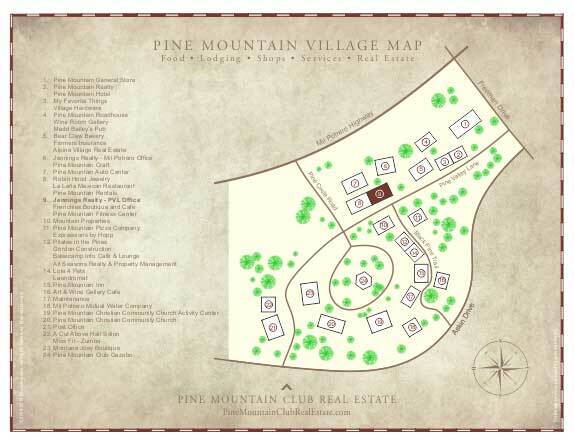 Pine Mountain Village is at the heart of Pine Mountain Club offering residents and visitors convenient shopping, dining, and services. Complete automotive service, maintenance and repairs specializing in foreign and domestic passenger cars, SUVs and light trucks. All brands of tires available, including studded and stud-less snow tires and Spider-Spikes for safe winter driving. Hours: Monday through Sunday, 9 am to 5 pm. Gas 24 hours a day with credit or debit card. Location: 16300 Mil Potrero Highway in the Village Center. More than just hardware! Our expanded inventory includes auto and bicycle supplies, cleaning supplies, electrical, garden, hardware, keys made, office supplies, paint supplies, pet supplies, plumbing, small appliance and tool repair. “The Original Pine Mountain Bakery and Coffee House” Pies, pastries, and bread baked fresh daily. Full coffee service available, including espressos, lattes, and mochas. Delicious soups served daily. Hours: Monday, Thursday and Friday 7 am to 2 pm, Saturday 8 am to 4 pm, Sunday 8 am to 2 pm. Closed Tuesday and Wednesday. Montana Joey Boutique features Men's and Women's apparel, Small to Plus Sizes. We feature designer lines including True Grit, Tianello, Rico, Spenser Alexis, Flax, Colorado Clothing and more. We also carry various gifts and home decor. Serving Pine Mountain Club, the Mountain Communities, the Central Coast, and Kern County. Robin Hood Jewelry specializes in jewelry repairs and custom orders. We sell all types of jewelry, from southwestern silver to gold and diamond wedding sets. We also replace watch batteries and buy your scrap gold. Offering hairstyling, weaves, color specialists, manicures, pedicures, Acrylic nails, tanning sessions and beauty supplies. Providing expert coloring and hairstyling to meet the needs of women, men and children. Hours: Monday, Wednesday and Friday 10 am to 6 pm. Pilates is a method of exercise designed to stretch, strengthen, tone and add balance and flexibility to the entire body, particularly focusing on the abdomen and back. It is great for sports training and rehabilitation. Pilates also increases lung capacity and circulation through deep breathing, as well as increasing bone density and improving posture. Hours: Six days a week, 8 am to 8 pm, by appointment. Farmers is dedicated to being the right choice for auto, home, life, business, renters, umbrellas, boat and recreational insurance. An industry leading HelpPoint® claims service means you can count on us to be here when you need us. The perfect mountain getaway to rest, recharge, and recreate in the great outdoors. Considered the “local” market” by residents, you’ll find everything you need at the Pine Mountain General Store. Madd Bailey’s Pub is the neighborhood pub with live music, pool, darts, and we show all televised sports. Hours: 12 pm to 11 pm weekdays. 12 pm to 1:30 am Friday and Saturday. Excellent pizza, Salads, and assorted dishes. If you are starting a new business in the Pine Mountain Village or would like to make changes to your existing business listing, click the link below to send your information. To include a business logo in your listing, attach a high resolution image of the logo. The listing is FREE. If you have any questions, please call (661) 245-0100.